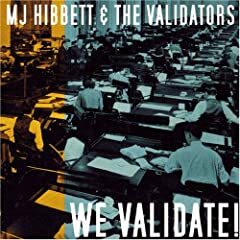 MJ Hibbett & The Validators – We Validate! Something somewhat different today, you see, We Validate! isn't so much underrated as it is completely under the radar. As well as being one of my favourite singer-songwriters MJ Hibbett is the sole decent musical export from my hometown of Peterborough and has amassed quite a large and brilliant catalogue of albums and EPs over the years. Of these, We Validate! is Hibbett's strongest release and is one that features his regular backing band, The Validators. Not only are said band great (if somewhat understated) but every single song on this record is superbly written and full of wisdom. It seems archaic to say so, but if nothing else We Validate! proves that it's still possible to turn to pop music for advice and comfort. Put this against all the “haircuts from the corporate indie scene” whom are riled against on 'Tell Me Something You Do Like' and it's obvious who comes out on top. Where many bands have been content in recent years to sing only about girls and nights out, MJ Hibbett has some genuinely interesting and fresh topics to discuss. The aforementioned 'Tell Me Something...' begs groups to discuss things they actually enjoy (suggestions include: Dr. Who, the feel of envelopes or LEGO bricks), the self explanatory 'Quality Of Life Enhancement Device', Thatcher-baiting 'The Fight For History' or the exquisite love song 'Better Things To Do'. And that's before we mention the epic 'Only Ever Meet In Church'. If you don't own any MJ Hibbett (with or without The Validators) then this is the best place to start and can be bought over here. It's a classic indie record, how it's supposed to be done.